If you re so lucky to have visited the Fiji islands, you are probably familiar with the taste and fragrances of those beautiful islands as much as you are with its music and dance, white sand beaches and lush coral reefs. You probably remember the earthy texture, the bitterish and spicy flavour of the national cerimonial drink, kava, made with the dried, pulverized root of a plant similar to pepper. Or the sweetness and consistence of the traditional coconut and tapioca cake, kasava. And the particular aroma that characterizes everything cooked in the underground ovens called lovo, literal holes in the ground where burning stones slowly cook meet, fish or vegetables wrapped in coconut leaves and covered up with earth. At the basis of the Fijian cuisine there's an ancient local tradition, drawing from the abundance and diversity that nature here offers. But Indian food is just as common at the Fiji, where half of the population is of Indian origin, having been brought over by the British to work on the sugar cane farms (girmits). So, while South Pacific and Sub Asian culinary cultures merge and overlap on your dinner table, at the Fiji every meal becomes a pleasurably surprising experience. 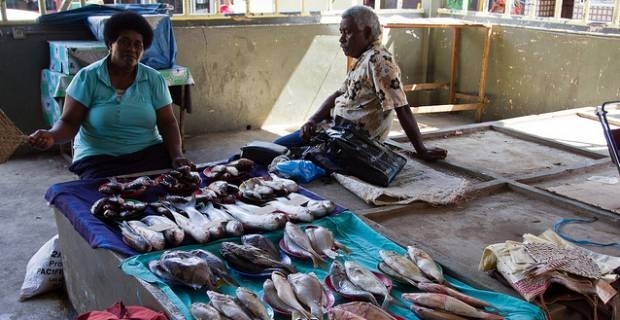 A traditional food of the Fiji, which in part they share with the Japanese, is raw fish, or kokoda. Taste real kokoda at its best as freshly caught fish from the pristine bluewaters around your favourite fijian island. Or, if you would like to dream with us, prepare it at home with few simple and easy to findingredients. Enjoy it! 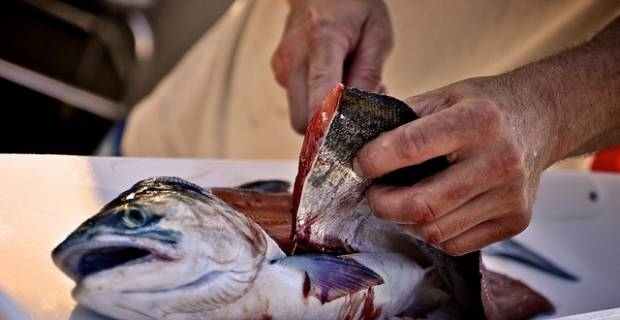 Remove the skin of the salmon and cut in small chunks or thin slices, then place in a glass or ceramic bowl. Add the juice and mix through. Cover with cling film and leave to marinate overnight. Before serving, prepare the dressing: chop finely tomatoes, chilli, coriander and spring onions. Mix in the coconut cream and set aside for a little while. Then toss in the marinated fish, after having drained all the remaining lime or lemon juice out of it. Season with salt if you wish, and serve on a bed of crispy spinach leaves. The lemon or lime juice, with its high acidity level, naturally cooks the fish. Marinating is a common alternative to cooking with flame, used in several countries with different types of meat and fish recipe. In this recipe, the acidic flavour is complemented by the sweet, rich coconut cream, which also blends in the finily sliced vegetables, herb and spices. A real delight for your tastebuds. For a full fijian experience, boil 2 large taro in salty water, slice and serve as side dish.